FANTASTIC ANNOUNCEMENT: On February 3, 2018, our team presented the Lykoi to the CFA Board and the Lykoi were approved in CFA (MISC Division). This wouldn't be possible without the help of the WORLD LYKOI ASSOCIATION, all who have been breeding and showing the Lykoi worldwide and mostly importantly, the founders of the breed Patti Thomas and Dr. Johnny & Brittney Gobble. Without all the ground work done by them, the Lykoi would not be a breed! We will be updating the website soon, but please contact me via email or phone if you would like to chat LYKOI. MEET THE LYKOI, a partially hairless breed of cat with a very unique color pattern that is a combination of amelanistic hair and solid color hair. 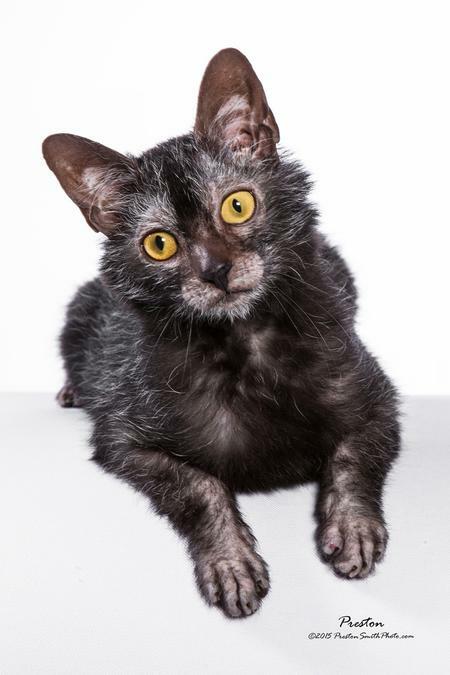 Lykoi are born with a full coat but in a couple weeks the "werewolf" pattern of hairlessness on the face and the roan pattern on the body begins to emerge. Note: The Lykoi are in no way related to the Sphynx breed. The Sphynx breed and Lykoi are never crossed in breeding. I am the fortunate owner of 2 natural Lykoi and 1 natural Lykoi carrier (originally feral and proven thru breeding) that were found in Caro, Mi and presented to me in 2016. I have started my program with these cats and a great deal of outcrossing between my naturals and other Lykoi obtained from other breeders. I expect to have full Lykoi kittens available as pets in 2018. The first "Lykoi" were found by Patti Thomas in 2010 after two unique, partially hairless feral kittens and their black domestic shorthair mother were discovered. Thomas took the kittens and mother into her home, and began doing numerous feline tests with her local veterinarian, as well as DNA testing with UCDavis for Sphynx and Rex coats (negative) to confirm the hairless trait is not caused by related genes. At that time, Thomas, who had captured enormous public interest in the two mutant kittens, made the decision to embark on the possibility of establishing a new breed. In April of 2011, Thomas contacted Johnny Gobble, DVM who agreed to take the kittens and their mother in a co-owned, joint partnership, to assist in the possibility of establishing a new breed. At that time, Thomas gave the "werewolf" appearing kittens the name Lykoi. A few months later a second Lykoi appearing pair was discovered by Gobble in TN. Genetic and health evaluations were performed by Gobble in association with Dr. Leslie Lyons to ensure the second pair was also of unknown origin. DNA panels for genetic disease, color and blood type as well as skin biopsies and echocardiograms were performed. The cats were found to be healthy and the hair pattern was not from any known disease or disorder. 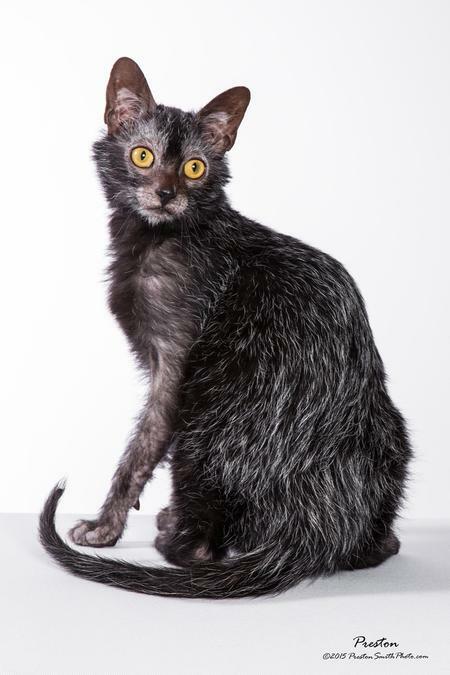 To confirm if indeed the unusual appearance was due to genetics, Dr. Johnny Gobble and his team bred two of the unrelated cats to produce the first intentionally bred Lykoi. On September 14, 2011, the first kitten from a Lykoi to Lykoi cat breeding was born. Since the mother to the original Lykoi kittens was a black domestic, extensive outcrossing with shorthair black domestic cats began. With time, it was determined that the gene was recessive, and to continue to reduce genetic inbreeding, more outcrossing with the domestic cats was done. In the past 6 years since these first intentional breeding, other Lykoi have been found in the feral cat population in Europe, South Africa, Australia, Canada, Texas, California and Michigan.